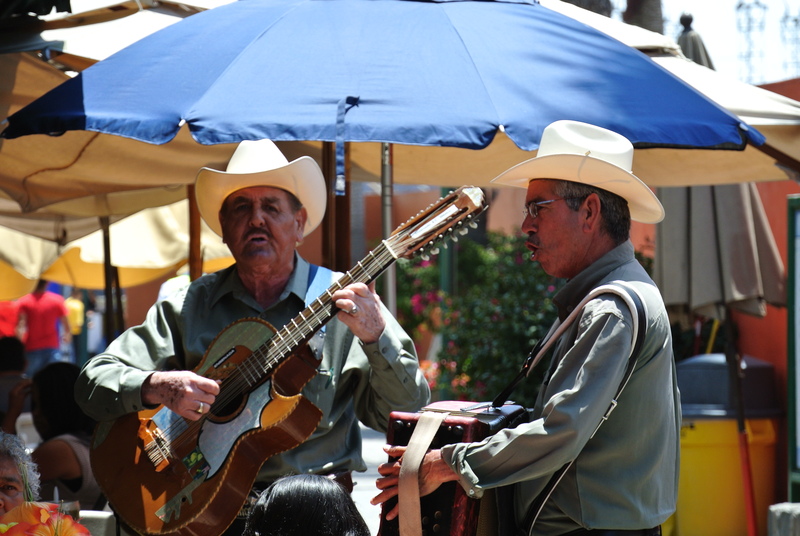 This past May David, Carmen and I decided to take a day trip to Ensenada, Baja California. As we arrived there was this magnificent flag waving its pride with glorious honor; A flag that seemed as foreign to me as I seemed to this country I am from. Our first stop was at the fish market. 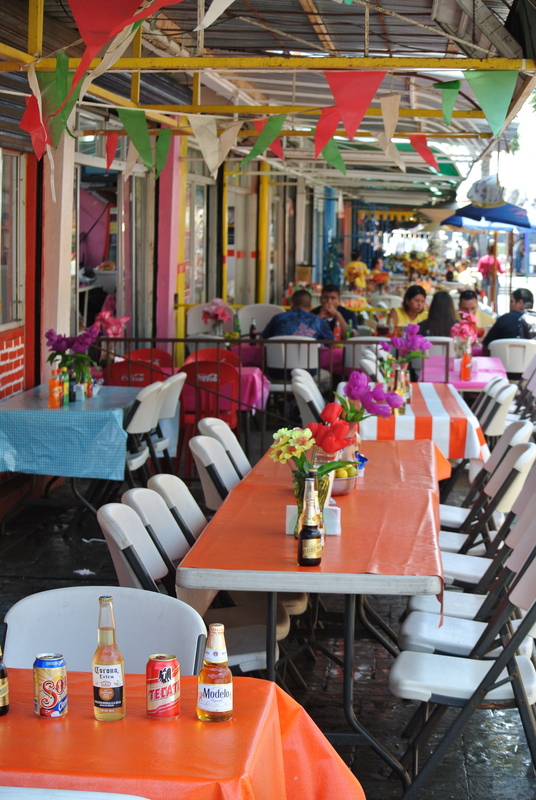 We found a picturesque row of fondas (small restaurants) with dining tables vibrantly draped in plastic table clothes. 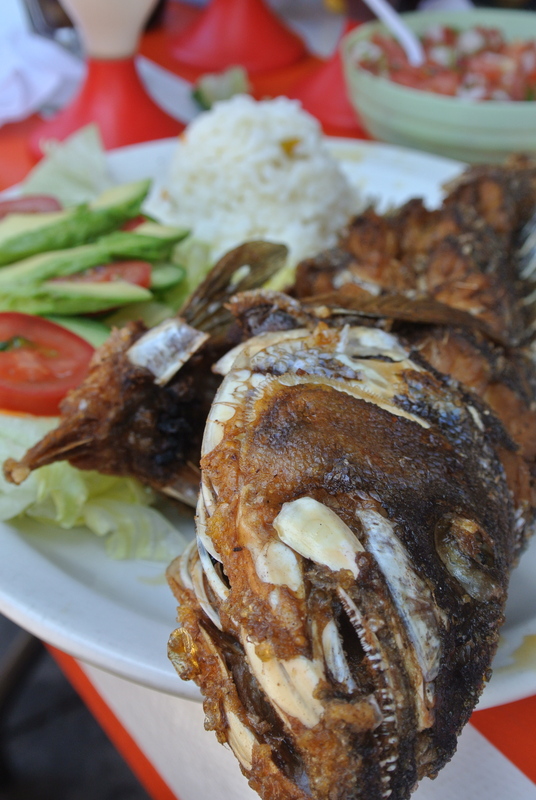 We sat and began to order from an enticing menu of fresh seafood. Una cancíon señorita? Unos arêtes, un collar, algo que le guste? 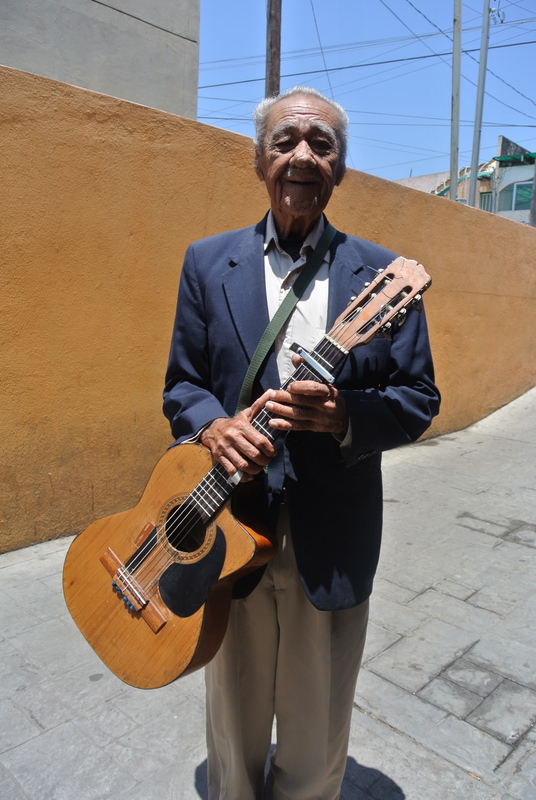 One by one the musicians and vendors kept coming recognizing in us an opportunity to earn their livelihood. To most of them I responded No Gracias as we sat there feasting on what I soon realized was an indulging display of food. 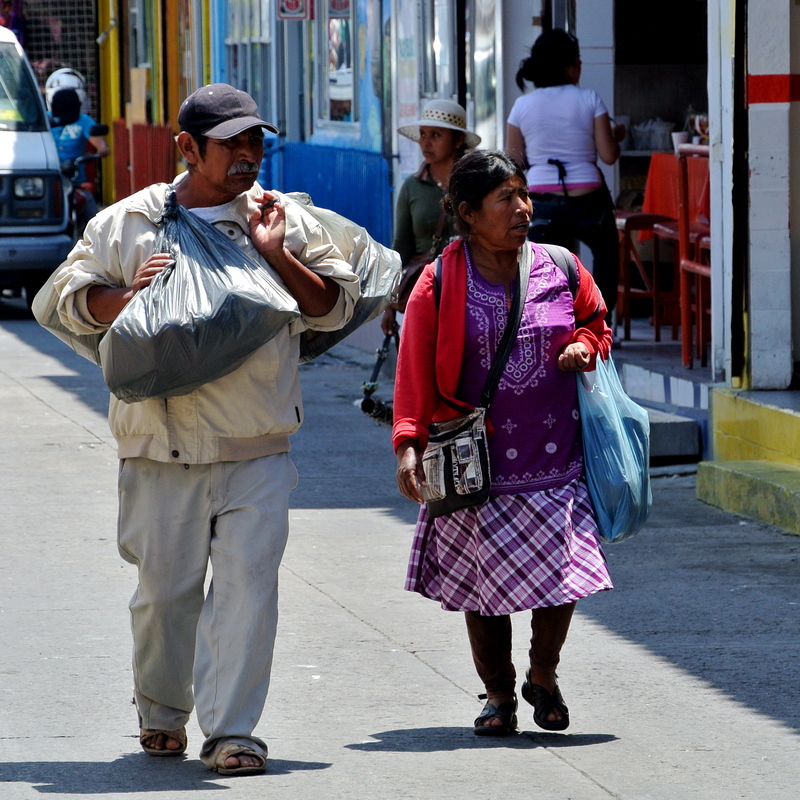 They count on people like us (tourists) to pay their rent and provide some sustenance for their family in a country where jobs are scarce and foreign-owned maquiladoras, export assembly plants, provide miserable salaries and working conditions. 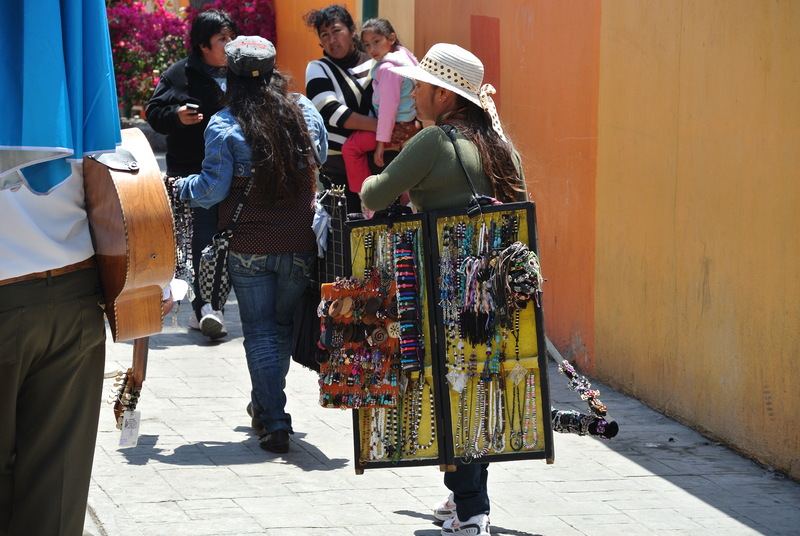 Maquiladoras are owned by U.S., Japanese, and European countries and some could be considered “sweatshops” composed of young women working for as little as 50 cents an hour, for up to ten hours a day, six days a week. (Misery of the Maquiladoras, 2011). How did I get to have so much power over the lives of others? For me NO was just a simple decision based on whether I liked or wanted to purchase and item. No for “them” was the difference between having food on the table or scraping by on air. I felt so privileged, so American, so much more distant to a land that I am from. My daughter asked me what was wrong; she could see the struggle on my face. I couldn’t quite articulate that I saw myself in each person. I knew that if I had never come to the United States, I would not have the privilege I enjoy now. I would have been a vendor, a farm worker like my grandmother, or perhaps a worker at a maquiladora. And certainly my daughter would not be attending a private institution like American University. “I feel so un-Mexican” is all I could respond. But it was more than that. There was a sense of betrayal. I had come to the United States and forgotten the spirit and struggle of the ones I had left behind. 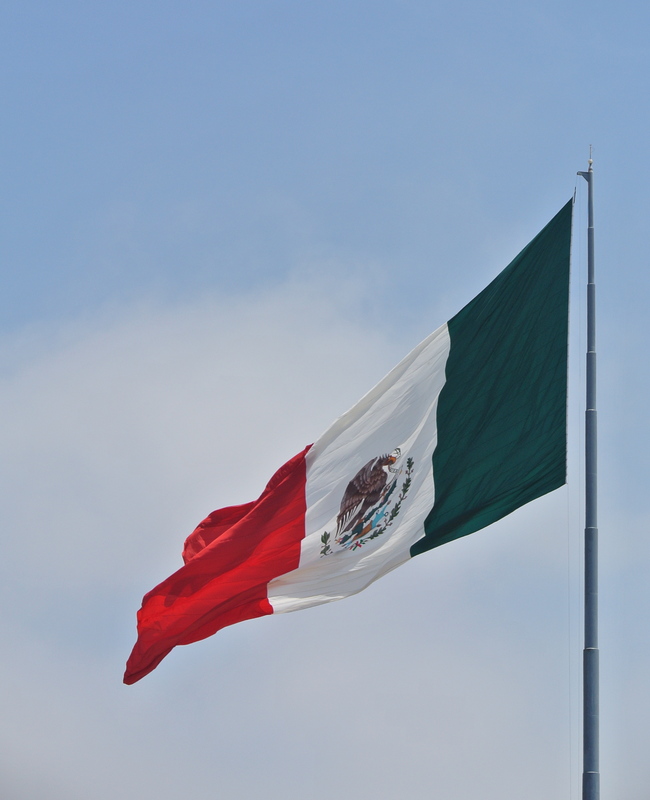 This wasn’t the first time I had been confronted with the poverty and despair of Mexico, but this was the first time I confronted my privilege. As the Universe would have it, a few minutes after I told Carmen how unMexican I felt, a woman standing behind us asked if there was any change we could spare so that she could buy her little girls something to eat. And there at that very instant, as I was feasting on a banquet of seafood, I came face to face with my privilege. In front of me was a woman with neglected hair lazily cascading down the sides of her face. Almond skin weathered by the unforgiving desert sun. A dusty and discolored crimson shirt slumped over stained pants. A child on her hip and another holding on to her right hand. Eyes of shame shielded by determination to feed her children. I invited her to have a seat with us. Amidst the silence of discomfort that occurs when two conflicting truths collide, I passed her the menu and told her to order whatever she wanted. 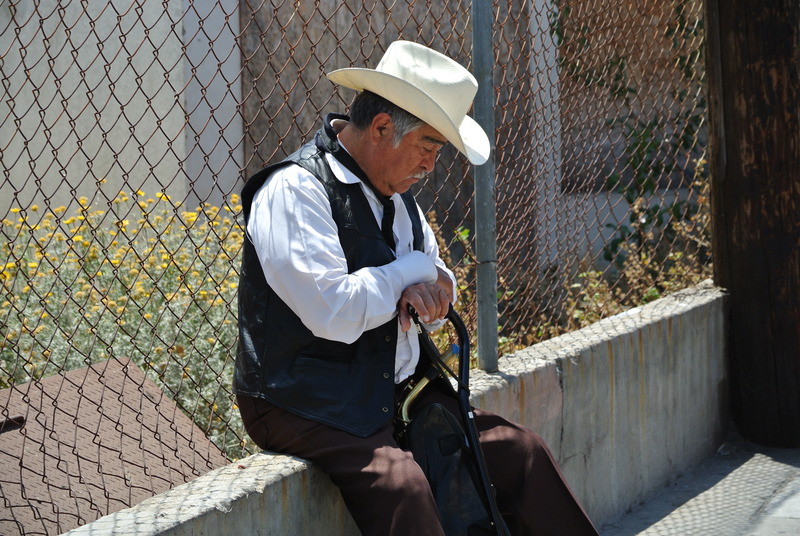 Lourdes had hitchhiked approximately 90 miles from Mexicali to Ensenada. The summers are merciless in the Mexicali desert for agricultural workers, so she works in the green onion farms of Ensenada during the summers. She explained she must harvest, clean and rubber band 50 dozen onion bundles for a pay of $100 pesos, approximately $7.50 U.S. dollars for a full day’s work. One of our meals alone was $10.00 dollars. Growers in Salinas and Watsonville, who also farm green onions in the Mexicali Valley, include Fresh Choice, Frank Capurro, VegaMix and Nunes Farms. 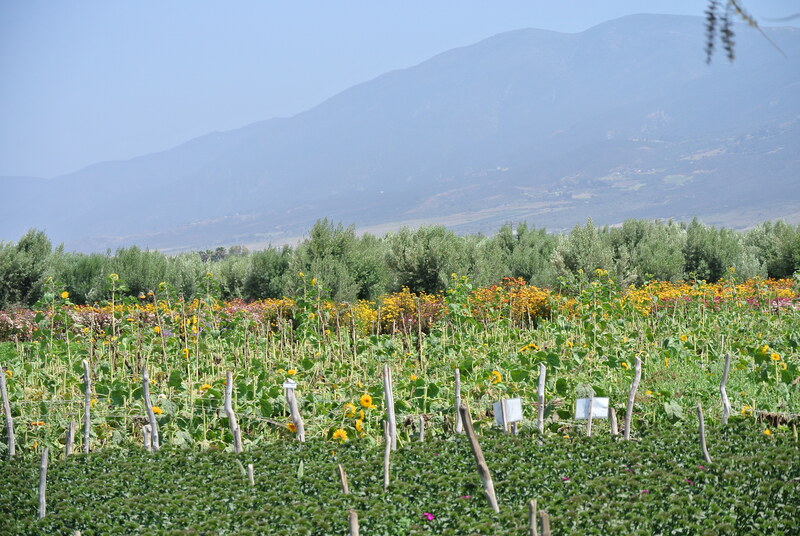 Arizona-based Phoenix Vegetable Growers has moved across the border, as has Muranaka, which comes from Oxnard. 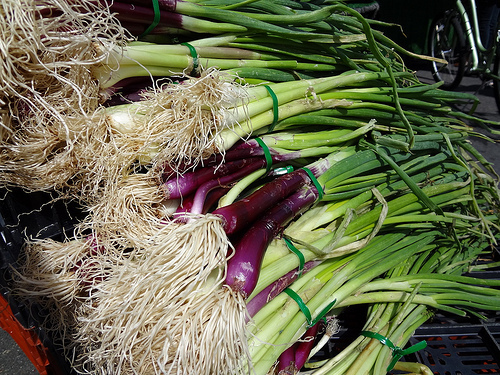 The soft conversations of hundreds of people, sitting in the rows next to great piles of scallions, fills the air. The vegetable’s pungent scent is everywhere. Small toddlers wander among the seated workers, some of them nursing on baby bottles, and others, their faces smeared with dirt, chewing on the onions. A few sleep in the rows, or in little makeshift beds of blankets in the vegetable bins. A closer look reveals that the toddlers are not the only children in this field. As the morning sun illuminates the faces of the workers, it reveals dozens of young girls and boys. By rough count, perhaps a quarter of the workers here are anywhere from 6 or 7 years old to 15 or 16. Lourdes explained that children weren’t allowed in the farms any longer because too many incidents of children being run over and killed with tractors had been reported. Lourdes has nowhere to leave her children, and the more green onions she harvests the more money she can make, so she has no other alternative but to impel her little girls to low wages and meager working conditions. The crew foremen just turn a blind eye. Just across the border these little girls would have the opportunity to reach unimaginable dreams. They could become the first in their family to graduate from a free public school with opportunities to apply for scholarships and attend a university. But in a country where doctors are washing dishes and a family in the fields can make more than an educated person, they will never know what it means to fulfill their personal legend. Colliding truths. I wondered what unrequited dreams this old man contemplated. I had seen the look on his face on my grandmother’s face so many times. 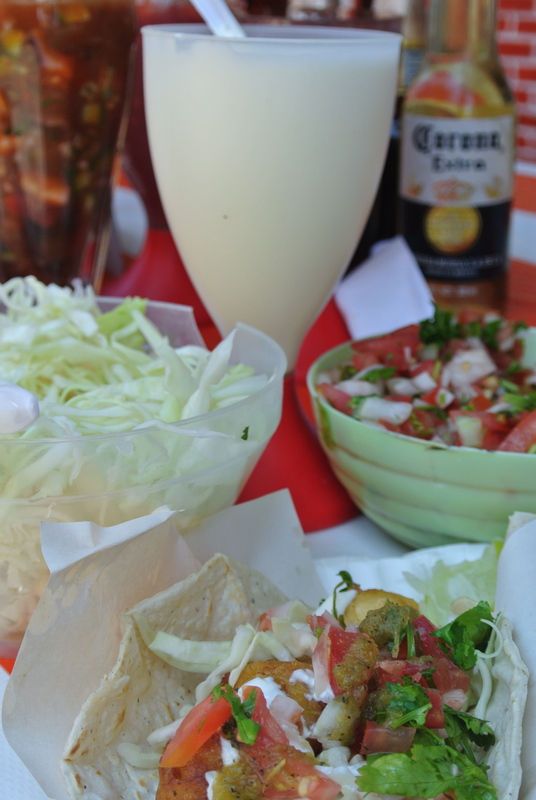 They devoured their fish tacos and gulped down their drinks. Before they left, I handed the woman $20 dollars. Que Dios la bendiga I said gently as she gathered her daughters to continue toward her destination. As we saw them disappear in the hustle and bustle of the fish market, my daughter put her hands over her face and sobbed inconsolably. Colliding truths. This time, there was nothing I could do to make her feel better. I sat there, ashamed, questioning why I had only given Lourdes $20 dollars. We have so far to go to deliver both Cristina. I will be thinking about this piece for a long time. Thank you for nudging me in your unassuming way and reminding me to get busy. Thank you Ellen. I especially appreciate the paradox between truth and justice. The second part of this piece will challenge me to probe harder into why I only gave the woman $20. I saw a parallel between me and the “liberal humanist” in the novel Tortilla Curtain. It’s a very difficult piece to write, and I am trusting my spirit to take me where I need to go. I am in tears, Cristina. Thank you for sharing these intimate moments with us. I see parallels to the struggle even in our schools deciding who to help when. Agreed Nancy. It can be quite overwhelming, but I believe everything we see is a mirror of ourselves and my journey is to go deeper within through each experience, no matter how painful. I’m just so blessed to have friends like you to support me along the way!